In addition to fulfilling his commitments to Ozzy Osbourne, guitarist extraordinaire Gus G. has not only made his own band, Firewind, a parallel focus, he has somehow found time to record their latest tour de force for Century Media entitled ‘Days Of Defiance’ with fellow members Apollo Papathanasio (vocals), Petros Christo (bass), Bob Katsionis (keyboards) and newcomer Michael Ehre (drums). Like an oenophile denoting each distinct flavor, I find the admixture of Apollo’s voice to be as complex as a fine wine. Jorn Lande, Russell Allen, (the late) Ronnie James Dio, Bruce Dickinson and hints of Tim “Ripper” Owens are names which help me define the timbre of his throat. Additionally, the bravura with which he delivers the lyric proves him worthy of carrying his name. If including ‘Live Premonition,’ ‘Days of Defiance’ marks his 3rd recording with the band and the longest stay of any Firewind frontman to date. Despite the deliberate effort to present a heavier sound, ‘Days Of Defiance’ never sacrifices melody and hosts a variety of attitude. The more aggressive tracks such as ‘The Ark Of Lies,’ ‘World On Fire,’ ‘The Yearning’ and ‘When All Is Said And Done’ are juxtaposed with tracks approaching a more melodic rock sensibility (‘Embrace The Sun,’ ‘Cold As Ice’ and ‘Losing Faith’). The album includes a really great power ballad in ‘Broken’ as well as the more-chops-than-a-butchers-shop instrumental, ‘SKG’. This Dream Theater-esque track gives all band members a moment to shine brightly and features impressive single line playing from Gus and Bob as well as great bass lines by Petros. Michael Ehre and Apollo perform consistently well throughout and the double-bass showcase, ‘Heading For The Dawn’ is grandiose, full of momentum and offers a very memorable chorus (and is quite possibly my favorite of the lot). Although the overall production is wonderful, it suffers one very minor flaw. For some of the heavier tunes, the drums are mixed a bit differently. The kick and toms are a bit too prominent in the mix, which has a tendency to mask the bass and some of the nice keyboard atmospheres present in the tunes. Rather than offering anything overtly Promethean, any power/melodic metal band in 2010 is upholding a tradition blazed in earlier decades with bands such as Iron Maiden, Helloween and Dream Theater (amongst others). However, Firewind succeeds here, delivering a quality album paying homage to all the greats without sacrificing individuality. 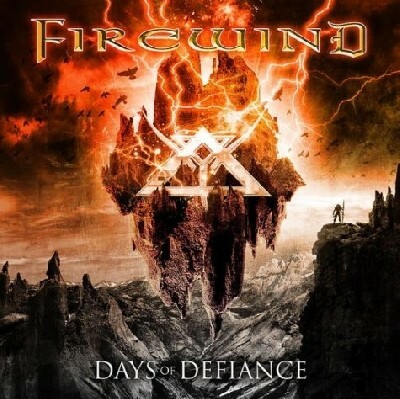 Indubitably, this is a welcome addition to the melodic/power metal canon and after a spin of ‘Days Of Defiance,’ any listener should agree that Firewind is a sinew of the genre. Fans of this style will not be disappointed with this release.